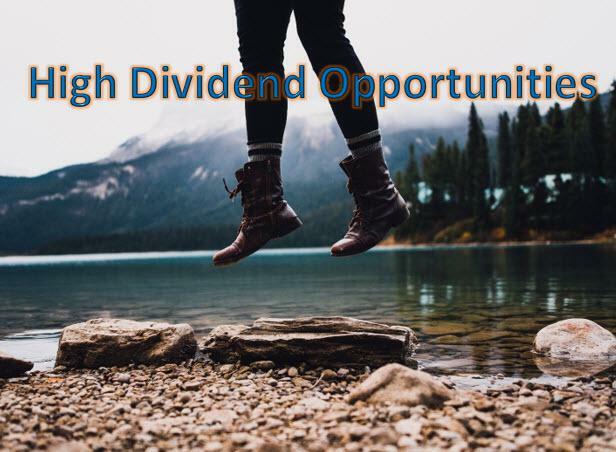 Spirit Realty Capital offers a 6.2% yield with a conservative payout ratio of 74%. With a quality portfolio and a quality balance sheet, and a 50% discount to peers, SRC is an easy pick. SRC is significantly undervalued compared to its peers. We expect the stock to return 30% in the next 12 to 24 months as valuations become more in line with the sector. We noted that one of our favorite defensive REIT sectors is “triple net” or NNN REITs. 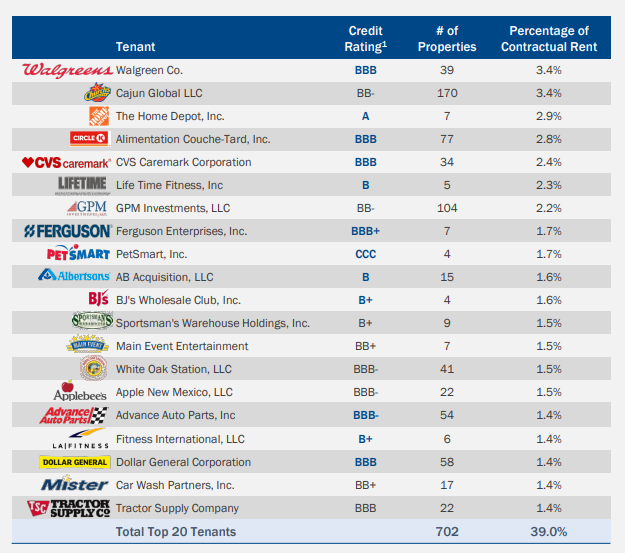 These REITs benefit from having long-term leases that make the tenant responsible for most property level expenses. This provides very stable revenues as the leases are designed to be predictable and are locations tenants intend to stay in for decades. It also provides for minimal and predictable expenses. With proper diversification among tenants, sector and geography, NNN REITs provide very stable and predictable cash flows, even in tough times. Many NNN REITs actually raised their dividend last recession as most of their leases have modest automatic escalators. The strength of the NNN REIT sector is not a secret and it has resulted in many of the REITs having high valuations and dividend yields below 5%. There's currently an opportunity for a REIT with portfolio quality and balance sheet metrics similar to premium peers, but trading at a significant discount with a 6% yield. It's a great opportunity to get into this defensive sector at a reasonable price. Spirit Realty Capital (SRC) has a somewhat troubled past, specifically, it was haunted by Shopko which in 2013 accounted for almost 30% of SRC's revenues. By 2017, it became increasingly apparent that Shopko was not healthy. One of the major appeals of triple-net lease REITs is that they tend to be very diversified by sector and by tenant. SRC's experience with Shopko is a great example of why diversity is key. While they made great progress in reducing their exposure from nearly 30%, down to a little over 8%, they could not get rid of Shopko fast enough. From 2013 through 2017, SRC's performance was OK, and SRC worked to slowly reduce the impact of Shopko. However, it was an open secret that Shopko was not a healthy company. The market continued to discount SRC relative to their peers, primarily due to their large exposure to Shopko. SRC created a plan to spin off their Shopko assets into a new REIT, Spirit Master Trust (SMTA). The move proved to be expedient as Shopko filed bankruptcy in January 2019. Additionally, SRC took the opportunity to dispose of their higher risk, non-investment grade tenants. They also passed on properties that had high mortgage debt, leveraged up assets going into SMTA, keeping the cash and passing along the debt, and retained preferred equity in the new structure. SRC also gets paid under an asset management agreement and a property management agreement. The deleveraging radically changed SRC's debt profile, improving its debt metrics. SRC was able to put that lower leverage and more flexible balance sheet to work right away, obtaining a $1.62 billion unsecured credit facility with an interest rate 15 bps and 10 bps lower than their prior term loan and revolver. 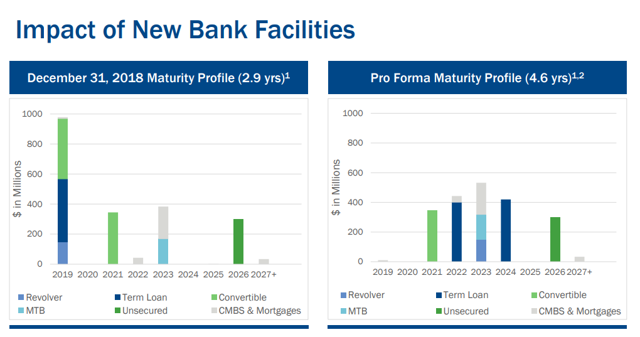 That new facility helps make for a more attractive and smoother debt maturity schedule. In terms of tenants, SRC has improved dramatically and now have a tenant list more along the lines of what's expected of a triple-net REIT. SRC actually has more diversity among their top tenants than either Realty Income (O) or National Retail Properties (NNN). 44% of their rent now comes from investment grade or equivalent tenants. SRC also boasts an impressive occupancy rate of 99.7%. SRC trades around 11x forward AFFO, NNN trades around 20x and O trades over 22x. We do not believe that SRC will rise to those lofty levels in the near future. After all, NNN and O have a long history of high quality and producing market-beating results. They have a level of trust with the market that cannot be created in a short time. We do expect that SRC will close that gap. By every measure, SRC is a substantially superior and more conservative REIT than it was prior to the spin off. Their portfolio metrics are in-line with their premium peers. In time, the market will come to realize that quality. A ratings upgrade would likely reflect the REIT demonstrating the following on a consistent basis: Net debt/EBITDA below 5.5x, continued earnings stability (with fixed charge coverage above 3.5x), secured debt below 10% of gross assets and unencumbered assets above 75% of gross assets. As outlined above, SRC hit all of those targets in Q4 of 2018. We expect that they will maintain them and over time will be awarded upgraded ratings. Currently, SRC is two steps below NNN and three steps below O. Since the cost of capital plays a major role in the total return for triple-net REITs, we believe that closing that gap will provide a material benefit to operations and valuation. SRC has hit the goals, they just need to sustain them for a period of time. Another possible catalyst for SRC is ending their relationship with SMTA. While SMTA has had no problems with paying the dividend on the preferred shares or paying the management contracts, SMTA is a distraction and SRC's continued association with it is likely hanging on the share price. In January, SMTA's board announced they are looking to speed up their strategic plan and are looking to sell the company, sell the master trust or merge. If such attempts are successful and result in SMTA terminating their relationship with SRC early, SRC stands to gain $241-$262 million from the repayment of the preferred shares, termination fees, and contractually guaranteed income. If SMTA fails to accelerate their plan, the current management contract is three years. One way or the other, SRC will eventually end their ties with SMTA. That will simplify their operations and make them even more similar to their premium peers. As of today, SRC has a fresh start. They have a quality portfolio of assets and a healthy balance sheet that provides room to grow. To solidify their future, SRC needs to focus on two things. They need to continue acquiring quality properties with quality tenants. They need to maintain their conservative balance sheet to obtain credit upgrades. Now that SRC has a quality portfolio, it's crucial that they maintain it. Things that we will be watching is the percentage of rent that comes from investment grade tenants. While NNN thrives with only 20% of revenue coming from investment grade tenants, they also have decades of results. We expect SRC will follow more in the path of O which receives 51% of rent from investment grade tenants. We want to see SRC maintain or grow their current 44%. Additionally, we will be watching to make sure that SRC does not repeat their previous habits by becoming over exposed to any single tenant or industry. We also want to see SRC maintain their leverage under 5.5x EBITDA. An increase in their credit rating is crucial to their long-term future. SRC has taken a rather dramatic action in spinning off a portion of their portfolio, which gave them an opportunity to improve their balance sheet quickly. An improved cost of capital will greatly improve their profitability and is a key part of our investment thesis. If SRC does anything to threaten that, it could cause their valuation to remain flat. We believe that SRC is off to a great start and has turned over a new leaf. This is a situation we will continue to monitor with a "trust but verify" approach. The spin-off of SMTA was transformational for SRC. Yet ghosts remain and SRC's history is continuing to hold down the share price. The credit agencies and likely the market are taking a wait and see approach to SRC. While the physical separation has occurred, it will take longer for the psychological separation to occur. This provides us with an opportunity to get a quality REIT in one of our targeted sectors at a large discount. Compared to premium peers like NNN and O, SRC has similar leverage, better tenant diversity, similar tenant quality, similar lease terms, and higher occupancy. Their balance sheet checks every item that Moody's is looking for before raising their credit rating. All SRC has to do to obtain credit upgrades is to maintain and show some consistency. When those upgrades occur, that should be a positive catalyst. Additionally, SMTA is making progress toward gaining independence. Cutting the final ties should go a long way toward getting the market to look at SRC as it is today, without the lens of the legacy SRC. After these catalysts occur, we believe SRC could trade at 15x AFFO, approximately $50/share. That is still a discount to premium peers, but would reflect their dramatically improved quality. That's over 25% upside from current prices in addition to a $2.50 annual dividend. SRC is a strong buy under $43.50. Disclosure: I am/we are long SRC. I wrote this article myself, and it expresses my own opinions. I am not receiving compensation for it (other than from Seeking Alpha). I have no business relationship with any company whose stock is mentioned in this article.